Although driving a motorcycle may be a riskier choice for transportation than driving a car, did you know that two-thirds of all motorcycle-car related accidents are a result of someone driving a car? Motorcyclists and car drivers alike should make sure to share the road and keep in mind some of our tips for safe driving. Be aware of blind spots. All cars have blind spots, and the small profile of a motorcycle makes it easier for motorcyclists to get lost in a driver’s blind spot. Both types of motorists should always use turn signals. Motorcyclists should be aware of other vehicles’ blindspots: if you can’t see another motorists’ mirrors, chances are he can’t see you. Wear appropriate protection. Seat belts save lives in cars, just as proper motorcycle protection save motorcyclists’ lives. Make sure to always wear a helmet. 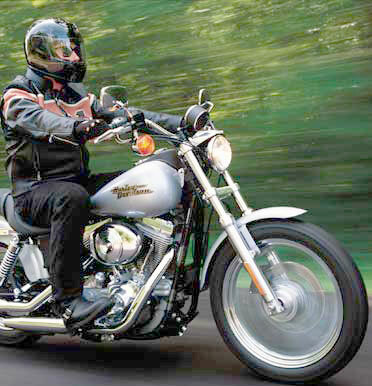 Leather gloves, jackets, and pants provide additional protection against debris and crashes. Be respectful. Car drivers, remember that motorcyclists have the same privileges as other drivers. Motorcyclists, be safe and respectful of other drivers; don’t weave through traffic, or travel on less than one lane. In addition, check out the RMV’s tips on sharing the road with motorcyclists. Remember, Murray and MacDonald Insurance Services carries several insurance companies that provide motorcycle insurance. If you would like to learn more, please call us at 508-540-2400.